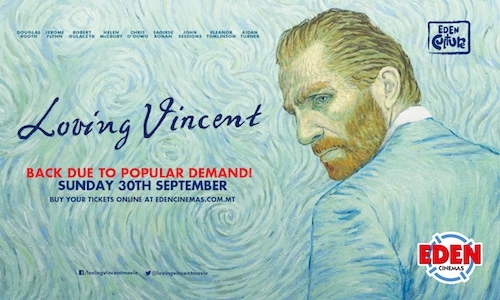 Loving Vincent is back due to popular demand for one show only - exclusively at the Eden Cinemas on Sunday 30th September. A unique animated masterpiece where every frame is a painting, ‘Loving Vincent’ begins after the death of van Gogh, and follows one man’s quest to discover how he really died. He is believed to have killed himself, but he seemingly went from completely calm to suicidal in just a few short weeks. In van Gogh’s own style of painting, we go along on an exploration of his extraordinary life and mysterious death. ‘Loving Vincent’ stars Douglas Booth, Jerome Flynn, Chris O’Dowd, Oscar-nominee Saoirse Ronan, Aiden Turner, Helen McCrory, Eleanor Tomlinson and John Sessions.